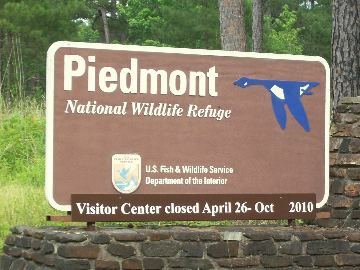 The Piedmont National Wildlife Refuge in Georgia is off of I-75 on the way from Tennessee to Florida. The park itself is about 18 miles from the interstate. There is no admission fee. It's perfect for hiking and relaxing. Nature lovers will love the scenery and variety of birds. As of this writing, visitor center bathrooms and picnic area are unavailable. The photos on this page were taken in June 2010. At that time the visitor center was closed for renovation. 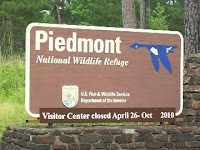 A wildlife viewing deck at the Piedmont Wildlife Refuge was created in partnership with Ducks Unlimited. It is fully accessible. Binoculars for viewing are provided. For the best viewing bringing your own set of is suggested. 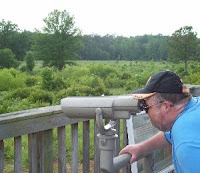 Binoculars are relatively inexpensive on Amazon. It's easy to spend an afternoon at the Piedmont Wildlife Refuge. Add more time for fishing or hiking. If you are traveling and have extra time this park may be worth the effort to find. as I'm hoping to create my own personal blog and want to learn where you got this from or exactly what the theme is named. Kudos!